My youngest daughter and I had a night out last week with dinner and a play. I am a season ticket subscriber to Broadway Across America Cincinnati. Each month I have dinner prior to play and have really made an effort to explore the restaurant scene in Cincinnati’s Over-The-Rhine (OTR). It has been fun exploring the food in OTR. My daughter and I decided to try Quan Hapa, an Asian fusion joint, with a really cool vibe. We were pretty excited to try this place and explore the culinary offerings. We ordered the Hapa Ramen (Tonkotsu style) and the chicken Banh Mi. The ramen included homemade noodles, poached egg, pork belly, green onions, sunflower shoots, shiso and burnt garlic chili oil. The chicken dish included adobo sauce, broccoli rabe and pickled cucumbers. Unfortunately, we were really disappointed with the dishes. The chicken dish was bland ( not what I was expecting with an adobo sauce) and the ramen were just so so. We didn’t even finish half of either dish. Maybe it was a bad night for the chef. Here is the link in case you want to check it out for yourself. We were still hungry leaving Quan Hapa, so much so we decided to grab a donut at Holtmans Donuts. http://www.holtmansdonutshop.com/ These are by far the best donuts in Cincinnati. Very cool place with a warm inviting atmosphere. A must-try if you are visiting downtown. After a quick carryout at Holtmans we headed over to the Senate. Senate is a trendy American restaurant in the heart of OTR. 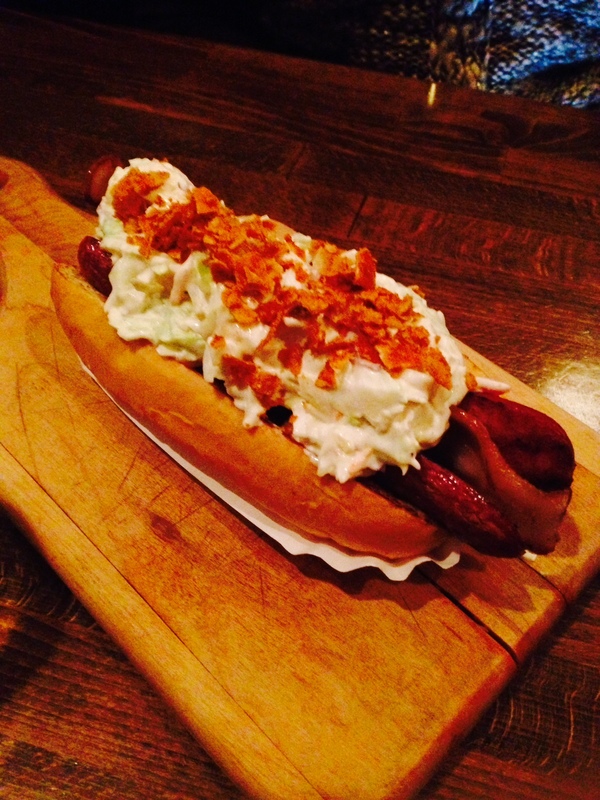 They serve gourmet hot dogs with creative toppings and feature local beers. We loved it! 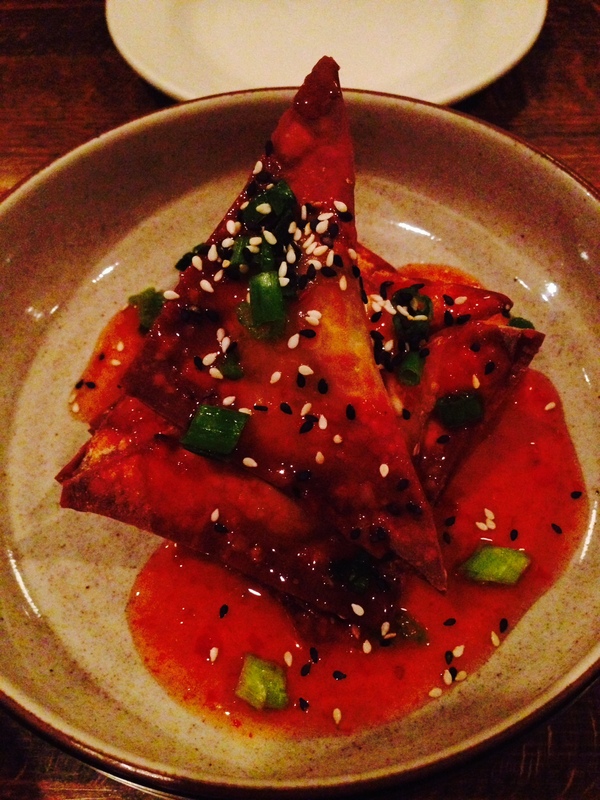 We started with a crispy potsticker made with housemade ginger-pork, sweet chili, miso cream cheese and sesame seeds. It was fantastic. We then moved on to the star of the show, the gourmet hot dog. We ordered the “Trailer Park” which consists of bacon wrapped beef hotdog, american cheese, coleslaw, crushed grippos on a brioche bun. After the Senate, it was off to the play. 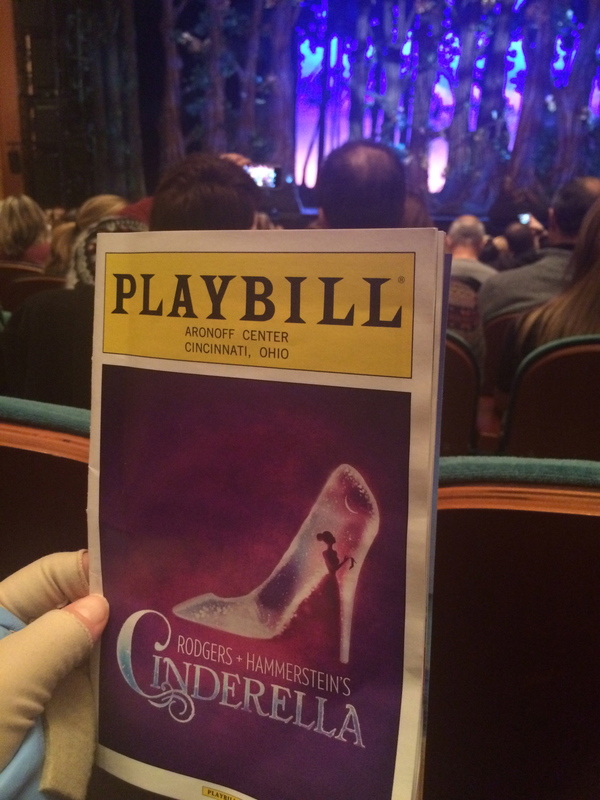 We saw Rodgers and Hammerstein’s Cinderella. Wonderful show and evening with my girl.